Our session, “Gatsby, A Raisin in the Sun, and Inequality Today: Nurturing Student Voices About Equity and Justice,” was full of engaged, thoughtful teachers eager to think about how we can use these classic, canonical texts to help students think about equity and justice. 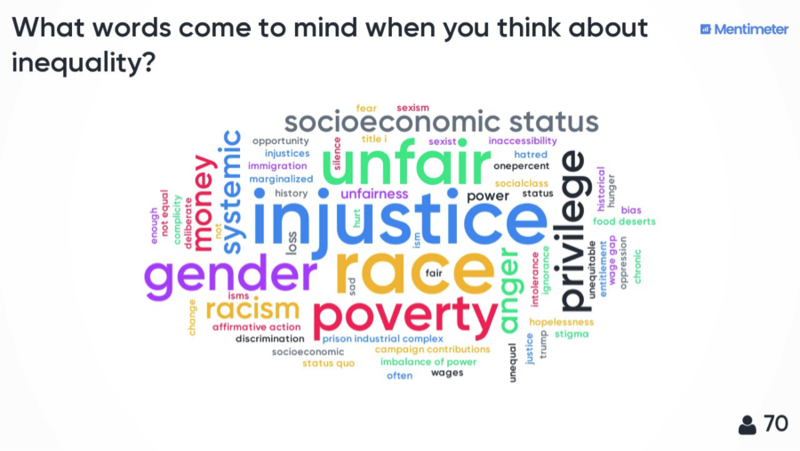 We asked our audience members, using our newest favorite tool, Mentimeter, to share their thoughts about inequality. 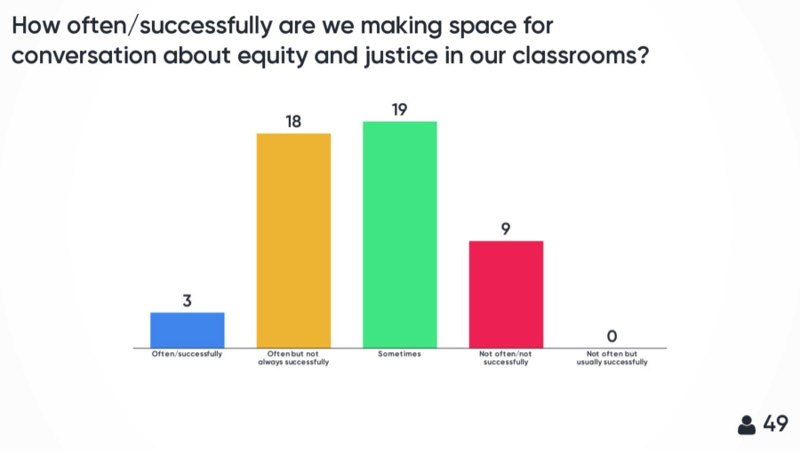 We also asked them to consider how often/successfully we were making space for conversation about equity and justice in our classrooms. Those yellow and green bars reflect those who are often making space, but not always successfully or sometimes doing so. Only a few (3) of our attendees were confident that they were making space often and doing so successfully. We aren’t there yet, but, for most of us, we are trying. 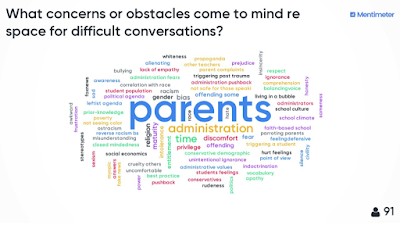 In an active and energetic session, full of interesting questions, interjections, and comments from the audience, we talked together about making space for these conversations. We started with our ideas about using Gatsby to think about xenophobia and racism (vis-à-vis the rant from Tom Buchanan about the threat of immigration to the continuance of what he sees as the rightful dominance of the white race). We also talked about using social psychologist Paul Piff’s work in relation to Gatsby to unpack the question of whether money makes people (like Tom) mean, i.e., whether entitlement breeds bullying, greed, and unethical behavior. 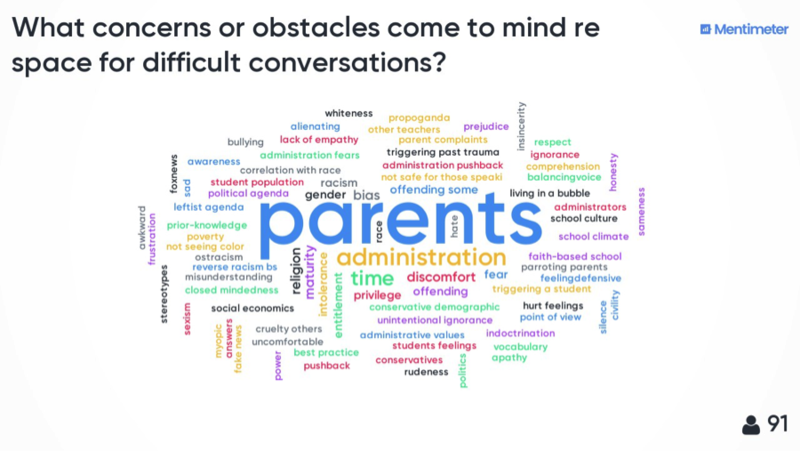 Finally, we talked about using a report documenting the violence surrounding the desegregation of the Trumbull Park homes in 1953 Chicago to help students connect A Raisin in the Sun to the broader context of violence involved in housing desegregation. If you missed our presentation and want to see more about these and other ideas, please check out our slides. Our work is also available in our books on Gatsby, Raisin, and Mockingbird from Rowman and Littlefield. We do this work because, for us, teaching language arts means teaching students to think carefully and critically about how a text works, about the language it uses, and the current and historical resonances of the ideas at play in the text. Our job in the classroom is to help students read and unpack Tom’s white nationalism and male privilege. Our students need to think critically about the ways in which Hansberry’s play is undergirded by a climate of violence, despite the limited references in the text to bombs and the oddly optimistic ending of the play (in contrast to an alternate ending Hansberry had considered, featuring an armed Younger family awaiting violence as they spend their first evening in their new home). 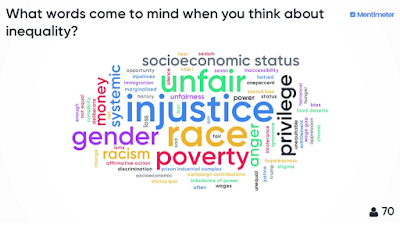 It is invigorating to be a part of a community eager to help students think through the ways in which our world is structured by privilege, educational inequality, educational inequality, voting restrictions, and poverty. And yes, we know there are obstacles. Many. Certainly, for us as English teachers, many of the writers we teach were rebels, revolutionaries, and activists. They were engaging big ideas and doing so in provocative, interesting ways. That’s why we read them. And certainly, as teachers, we want to make room for those rebellious, revolutionary, and activist voices in our students. We need our young folks to think critically about the big ideas and help change the problems in our world. So, perhaps we traffic in a revolutionary world, but that’s simply the nature of our discipline. We aren’t necessarily revolutionaries. We are just doing language arts. For many of us, that’s what we love about it. At least at NCTE, we are in good company with many, many people who share that vision.